"You can't win without us"
Volunteers for the national organization ALIPAC, dubbed "ALIPAC Eagles," are on the ground in Washington, DC, today delivering an important warning and petition to GOP lawmakers in the US Senate and House who will lose large numbers of conservative voters if they support, vote for, sign, or fail to veto any form of Amnesty for illegal immigrants. President Trump has indicated he is willing to sign a Dream Act, DACA, or even larger Immigration Reform Amnesty deal between Democrats and pro-Amnesty Republicans and has deployed his son-in-law Jared Kushner to cut the deal like he did with the secretive budget deal of Feb 15, 2019. ALIPAC hopes to make it clear to President Trump and all GOP candidates they can't win without the full support and votes of the more than 80% of Republican voters who fervently oppose any form of Amnesty for illegals such as H.R. 6. Pro-Amnesty Republican Senators are eager to vote with all of the Democrats to pass Amnesty just as 14 Republicans did to pass Obama's Amnesty bill S. 744 on 06/27/13. Thankfully the GOP controlled House stopped S. 744 from becoming law but only after Republican Senators John McCain (AZ), Lindsey Graham (SC), Marco Rubio (FL), Jeff Flake (AZ) — the four GOP authors of the underlying legislation — and Senators Bob Corker (TN), Kelly Ayotte (NH), Jeff Chiesa (NJ), Susan Collins (ME), Orrin Hatch (UT), Dean Heller (NV), Mark Kirk (IL), John Hoeven (ND), Lisa Murkowski (AK) and Lamar Alexander (TN) voted to give Amnesty to millions of illegal aliens. "While we cannot overcome the grotesque financial advantage these GOP sellout Amnesty supporters in DC have in elections, they can't win without us, and we are now organizing conservative voters who are willing to refuse to support any Republican that backs Amnesty including President Trump," said William Gheen, President of ALIPAC. "If Trump wants to carry swing states like my home state of North Carolina in 2020, he needs to shut down and reverse his current plans to give Amnesty to illegal aliens and refocus his efforts on the campaign promises he made on immigration in 2016 instead. If Trump signs any Amnesty bill including HR-6, he can't win swing states without voters like us. Perhaps if we refuse to vote for Republicans who act like Democrats on immigration issues, we can eventually get lawmakers in these seats who represent Americans instead of foreigners, which is a form of taxation without representation." ALIPAC plans to raise funds to advertise the new petition found at www.AGAINSTAMNESTY.com in swing states, swing districts, and the states where GOP incumbent Senators are up for reelection in 2020. ALIPAC activists are currently focused on warning Class 2 Senators on the ballot next year such as Senators Shelly Moore Capito (R-WV), Bill Cassidy (R-LA), Susan Collins (R-ME), John Cornyn (R-TX), Tom Cotton (R-AR), Steve Daines (R-MT), Michael Enzi (R-WY), Joni Ernst (R-IA), Lindsey Graham (R-SC), Cindy Hyde-Smith (R-MS), James Inhof (R-OK), Mitch McConnell (R-KY), David Perdue (R-GA), James Risch (R-ID), Pat Roberts (R-KS), Mike Rounds (R-SD), Ben Sasse (R-NE), Dan Sullivan (R-AK), and Thom Tillis (R-NC). "We the undersigned, hereby inform President Donald J. Trump that we will no longer support or vote for him or any member of Congress who supports Dream Act, DACA, or Immigration Reform Amnesty for illegal immigrants, or passes anymore laws like the February 15, 2019, budget bill which denied US citizens a chance to even know what was in the bill! We define AMNESTY as any change in America's current laws, which waives current penalties such as deportation for illegal aliens, accommodates them, grants them legal status, or a pathway to citizenship and voting rights. We will not vote for or support any Democrat or Republican including President Trump unless they oppose, vote against, and veto any form of Amnesty for illegals." 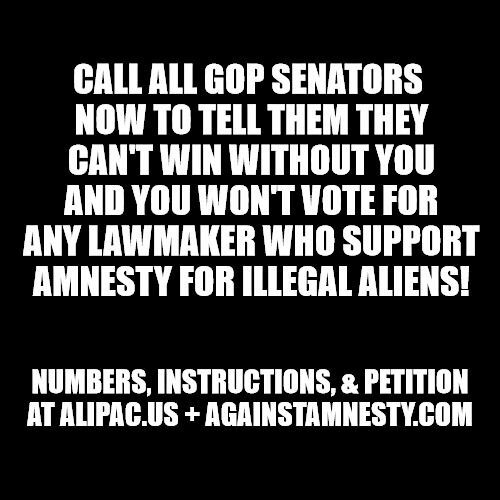 While large numbers of Republicans refusing to vote for pro-Amnesty GOP incumbents will elect more pro-Amnesty Democrats, ALIPAC sees no difference between the lawmakers of either party affiliation who are willing to permanently destroy America's borders and give Democrats a monopoly over all US elections, government agencies, and laws through Amnesty legislation. ALIPAC's new message of "You can't win without us!" is expected to have an impact on GOP elected officials who win by narrow margins like President Trump. Last edited by ALIPAC; 03-20-2019 at 02:02 PM. Take action, all ALIPAC Activists! We need you to make a large wave of angry calls to all GOP members of the US Senate today as our ALIPAC Eagles go office to office on the ground in DC to deliver this flyer (VIEW HERE)! Amnesty bill HR-6 is on the move in the House where we will likely lose the fight, and as you can see from our press release, RINO Republicans will pass it with the Democrats in the Senate unless you make it clear to them you won't vote for them if they do! "Tell Senator _____ he/she can't win reelection without conservative voters like me, and I will refuse to support or vote for any Republican who votes for, signs, or fails to veto any form of Dreamer, DACA, or Immigration Reform Amnesty like HR-6, which would destroy America's borders and hand future control of US elections and laws to Democrats forevermore." ALIPAC President William Gheen plans to Go Live on Facebook and Twitter between 10-11am ET today, Thursday, March 21. Please monitor our pages at the links above and share the Go Live video soon as you can see it to help us bypass Silicon Valley censorship designed to silence and stop us! Last edited by ALIPAC; 03-20-2019 at 01:55 PM.